The Galaxy S6 handsets were Samsung’s master stroke devices that got them out of the momentary slowdown that truly began with Galaxy S3, intensified with Galaxy S4, and got cemented in the form of Galaxy S5. But thanks to all-new beautiful design with glass back, and dual-curve screen on S6 Edge, Samsung was able to bounce back, and today we have the Galaxy S8, S8 Plus and Galaxy Note 8 as among the best handsets on planet. But these two beautiful handsets still pretty old now, and there is no way we can expect Samsung to work the Oreo update for the Galaxy S6 and Galaxy S6 Edge. Which is why we have to look towards custom ROM community for this — particularly LineageOS 15 ROM, that’s based on Android 8.0 and is already available for bunch of devices, even though the builds are alpha, nothing close to stable. Mind you, the LineageOS team has revealed recently that they continue to work on the LineageOS 15 ROM, but cannot give an ETA of first official release of LineageOS 15 ROM just yet. 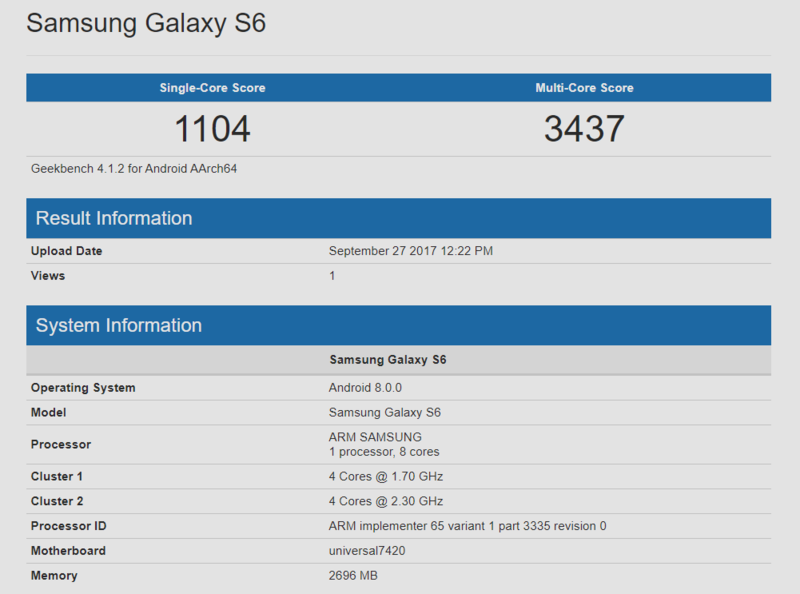 However, here we are, with a Galaxy S6 handset powered by Android 8.0.0 OS, listed on Geekbench — our trusted source for many purposes, whether that be a news about a new device, or an update for on-market handset. Our guess is that someone was able to run a LineageOS 15 ROM on the Galaxy S6, and ran a Geekbench test. It could be any other ROM, but given how LineageOS ROM is ruling the AOSP scene, LineageOS 15 remains best bet. And why not, it’s the best custom ROM out there too. Although, given how easy it is to edit the build.prop and replace the Android 7.0 OS version with Android 8.0.0 version with root access, this could simply be a device running Android 7.0. Now, because Galaxy S6 has a nicely working LineageOS 14.1 ROM available, we think it would get the LineageOS 15 ROM roo sooner or later, and this listing could be of a test build of the very same ROM. Check out our page on Android Oreo update release for all popular Android devices, to know where each one of those stands as regards Nougat update.